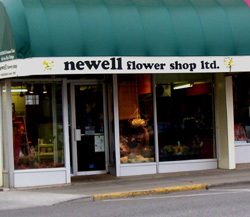 Newell Flower Shop is conveniently located in the downtown business district, and has been supplying the freshest floral products to Kamloops and area residents since 1938. Our staff welcomes the opportunity to assist you with your floral purchase. We would be delighted to customize your order as requested . Our design and sales associates are well versed in all aspects of the floral business. We have our own delivery vans and courteous drivers, so we know your flowers will arrive promptly and safely.... as if you had delivered them yourself!